Reading experimental poetry can feel like driving in a traffic jam: you read one line over and over, trying to “get” it, tentatively proceed to the next line, feel even more like you are drowning in blank confusion, flee back to the previous line, read the two lines together a few times to see if their meaning can perhaps be “unlocked” that way, then go back to reading the first line alone because maybe you got it all wrong the first time; eventually, feeling none the wiser, you look up at the clock and realize a half-hour has passed and you haven’t even reached the third line yet. 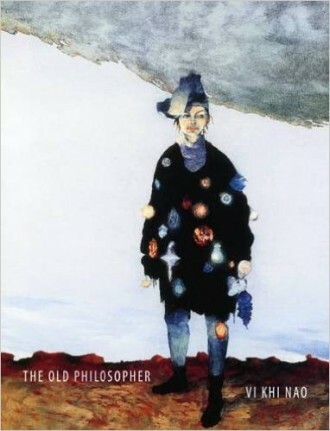 Fortunately, Vi Khi Nao’s debut poetry collection The Old Philosopher, though ravishingly experimental, is not like that. Nao’s poems are eminently readable, having a brisk, breezy, informal voice (“See ya around, pancake faces,” the speaker of one poem says slangily) and being widely spaced on the page in a way that invites the eye to partake. Reading her words, you find yourself turning pages at a rapid clip. throat of the sock steamed my toes. there was much dying to do…. The theme of work (“the sun did not show up for work”) and the motifs of offices and co-workers recur insistently in Vi Khi Nao’s verse, reminding us that a full understanding of the human condition cannot omit labor economics, that the political systems of capitalism and communism have shaped and are continually shaping our experiences. “Today I Lost My Hat” ends with a Laforguian exclamation, capped with a Laforguian exclamation mark: “How death makes one suffer!” As in Laforgue’s work, this line is wrapped in self-awareness: the poet is fully aware of how inadequate this conclusion is, how unhelpfully general and abstract, and yet wants to make the point that our responses to death and suffering are defined by their inadequacy, that this is what makes us human and not God. That final line, “I suppose I could go on,” is quintessentially French Modernist in its jadedness, in the way it breaks the fourth wall, in the way it resists tying the story up with a neat little bow. With that line, Vi Khi Nao is rejecting an outdated mode of storytelling; as if with a shrug that says “Haven’t we been here already?” she is turning the conversation back over to the reader, forcing us to share the task of considering how to move the genre of Vietnam literature forward without retreading the same old tropes we all already know. In this deeply moving poem, the poet plays games with proportions, shrinking down large things while magnifying small things (pores, blood vessels, soap suds). This, the book seems to say at last, is the culmination of the experiment; this is what experimental poetry can do at its best: make us see from all sides at once, like a cubist painting, the beauty and frailty and integrity and loving bonds of human lives. Jenna Le‘s book reviews have been published in such venues as The Rumpus, Pleiades, Poetry Northwest, and The Pharos, while her poetry has appeared widely, including her two published poetry collections, Six Rivers (NYQ Books, 2011) and A History of the Cetacean American Diaspora (Anchor & Plume Press, 2016).